If you need some help clearing leaves, dirt or debris then a leaf blower can be a smart purchase. There are four main categories that blowers can fall under which includes backpack gas powered blowers, gas handheld leaf blowers, electric blowers, and cordless electric or battery powered blowers. Backpack units provide the most power, but also weigh the most, are the most expensive, and you need hearing protection to use. They typically weigh between 15-25 pounds, but that weight of the engine is supported by your back instead of having to carry it with your arms. A handheld unit also uses a gas engine, but are lighter at around 10 pounds, and put out slightly less power. 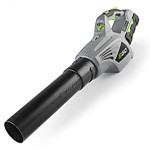 Electric blowers require you to use an extension cord to get power while putting out power comparable or slightly better than a gas handheld model. They weigh less at around 7 pounds, are quiet, and are by far the cheapest option available. Cordless electric varieties use batteries, usually li-ion, to provide energy. These units are quiet and do not have a cord to limit your mobility, but are more expensive and put out less power than a corded electric leaf blower. For professional landscape use or extremely large areas we recommend backpack models. For homeowners with larger than average yards we advise that you use a handheld gas powered unit or a cordless version. 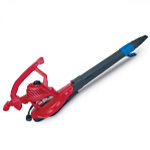 If you are on a tight budget or have a smallish yard then go with an electric leaf blower. We rated all these types of leaf blowers from the top brands to come up with our final rankings. Below is our review of the best leaf blowers. 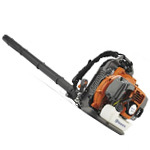 We selected the Husqvarna 560BTS as the best leaf blower. This backpack blower features a 65.6cc 2-cycle engine that puts out the highest max airflow of 632 CFM at a max velocity of 232 MPH. Users overwhelmingly give this model positive reviews thanks to its amazing power to handle even large piles of soggy wet leaves, but you will probably want to use ear protection due to the loud engine. The negatives are the price, noise, and weight – at 23.5 pounds it is the heaviest model on our list. However, the Husqvarna 560BTS is the perfect choice for professionals who need the most power they can get. The Makita BBX7600N gets commercial quality output from a 4-stroke gas powered engine that passes all EPA carb emission standards and means you do not have to worry about mixing oil and gas like you do with a 2-cycle engine. Most owners note how easily it starts. It puts out a max air speed of 195 mph and a max air volume of 526 cubic fpm (feet per minute). It is 22.6 lbs and has a noise level of 74 decibels which is much less than other backpack blowers. The main drawback is that it is the most expensive leaf blower on our list, but for professionals or anyone with a large piece of property the Makita BBX7600N is worth it. The Husqvarna 350BT is a mid-level backpack leaf blower that is a good choice for landscape contractors or home owners with a lot of land. It provides 494 CFM at 180 MPH thanks to the 50cc engine. While less powerful than our top two choices, overall it delivers enough power to move leaves and other debris easily. It also is comfortable and easy to use. One drawback is the noise level which will probably require the operator to use hearing protection. 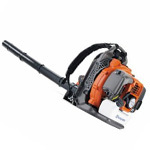 The cheapest backup leaf blower on this list is the Husqvarna 150BT. It is very similar to the 350BT, but has a smaller diameter tube which results in a higher velocity of 215 MPH, but a smaller airflow of 434 CFM. This results in a blower that can move stuck material easier, but will struggle to move larger amounts of debris at one time. Overall the Husqvarna 150BT has been around a long time and has a good track record of performance. The cheaper 150BT is a perfect choice for a home owner with a large yard, but might not make the best choice for professional landscapers who need a higher airflow. 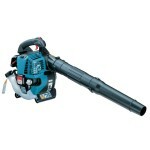 Our choice for the best gas handheld leaf blower is the Makita BHX2500CA. It has a CARB compliant, fuel efficient 4-stroke engine. That engine is easy to start and produces significantly less noise – just 67 decibels – than comparable 2-cycle engines. It has a 145 mph max speed and 358 CFM max air volume, while weighing in at 9.8 lbs. We highly recommend this unit for home owners who have a large yard that can’t be reached with electric models with extension cords. The best electric leaf blower and the best leaf blower under $100 is the Toro 51621 Ultra Plus. The leading consumer magazine also rated the 51621 as the best electric blower. This quiet model provides the most velocity of any machine on our list at 250 MPH. That enables the Toro 51621 to handle almost any task, as long as you have enough extension cords to reach your entire property. Other features include vacuum and bag with shred ring that reduces 97% of mulched debris to less than 1/2-inch. It also has an oscillating nozzle kit that will clear a wider path with automating air flow. Overall the Toro 51621 is perfect for a home owner with a small yard since it is cheap, quiet, powerful, and only limited to how far an extension cord can reach. Close in performance and about $60 cheaper than the Makita is our second choice for best gas handheld blower the Hitachi RB24EAP. It has a CARB compliant 2-cycle engine that has a max airspeed of 170 mph and a high airflow of 441 CFM. Weighing in at 8.6 pounds it is also backed by a 7 year consumer warranty. Overall the performance is solid, but it is quite loud and users should use hearing protection. 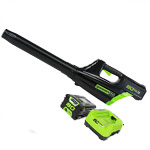 The GreenWorks GBL80300 is the best cordless leaf blower. This 80V unit can compete with gas and corded electric models by putting out 500 CFM with a max velocity of 125 MPH. The li-ion batteries will last about 70 minutes on the lowest power setting and 20 minutes on the highest and can recharge in 30 minutes, but you need to unplug the charger once charged or you can ruin the batteries. One complaint is that there is a 2-second delay from when you pull the trigger. The GreenWorks GBL80300 is also one of the most expensive cordless versions on out list, but the convenience is worth it if you need a blower that has unlimited range and don’t want to mess with a gas-powered engine. 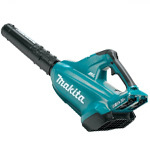 A close second in a cordless version is the Makita XBU02Z. While it is listed as a 36V model, it actually uses two 18v LXT li-ion batteries which are not included and must be purchased separately. 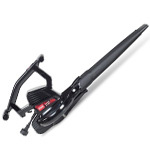 It can handle most tasks since it is really powerful for a cordless with 473 CFM of airflow and a max velocity of 120 MPH. The main draw back is the expense since it costs well over $300 once you buy batteries as well. However, if you already have any Makita cordless tools that use the 18v LXT batteries then you can use those batteries in this unit which makes it a better buy. One of the best-selling leaf blowers is the Toro 51619. It is very similar to the 51621 including matching airflow and velocity, however it does not have the oscillating nozzle nor the shred ring. It features 3-in-1 uses including a vacuum and leaf shredder. Overall the Toro 51619 Ultra Blower Vac is capable of handling most residential jobs where you can reach with an extension cord. 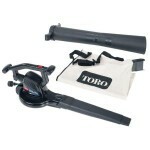 The Toro 51618 is another solid choice for an electric leaf blower. It features a max speed of 225 mph and a max air volume of 390 CFM, while weighing only 7.2 lbs and having a noise rating of 63 dB. 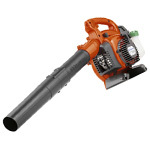 Not only is this a blower, but it also can vacuum and shred leaves. The built-in leaf shredder can reduce yard waste from 10 bags into 1 bag. The price for this unit makes it a great choice for those of you with a small yard where an extension cord can reach all areas. 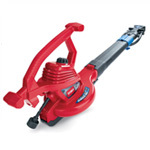 Another option for a cordless model is the 56V EGO Power+ LB4801. 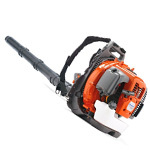 It is priced almost $100 less than some of the higher rated cordless blowers, but it also has weaker performance with only 92 MPH max velocity. The included li-ion battery can last up to 60 minutes on the lowest setting, but much less on a higher setting and can recharge in 40 minutes. Overall the weaker velocity will make the LB4801 struggle with wet leaves, but for dry debris the still good 480 CFM of airflow will work quite well. The cheapest leaf blower on our list is the Toro 51617. This Toro model is also the lighest leaf blower on our list at just 6.5 pounds. It uses 10.5 amps instead of 12 like the higher rated Toro units, so it has a bit less power. It still produces a high 215 MPH max velocity, but only 350 CFM of max airflow. The Toro 51617 is a good choice for home owners with primarily light duty debris clean up tasks. The Husqvarna 125B was rated as a best buy by the leading consumer magazine, but does not quite fair as well when rated by users. When it works right, it is a solid performing blower with 425 CFM of airflow. However, many users have complained that the fuel system breaks down when using gas with ethanol in it. So as long as you use non-ethanol gas the Husqvarna 125B is a quality model.